LONDON, England (CNN) -- This week's London Summit brings together the leaders of the world's 20 largest economic powers, known as the Group of 20, to discuss the global financial crisis and decide new measures to set the world on a more stable economic footing. 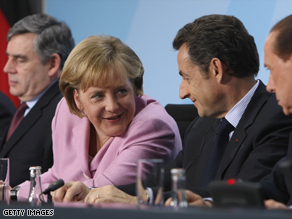 Gordon Brown (left to right), Angela Merkel, Nicolas Sarkozy and Silvio Berlusconi are among world leaders attending this week's G-20. British Prime Minister Gordon Brown, who hosts Thursday's talks, has set a bold agenda for this year's summit, calling on governments to sign up to a "global deal" to haul the world out of the crisis triggered by the collapse of the banking system. "We need a global New Deal -- a grand bargain between the countries and continents of this world -- so that the world economy can not only recover but... so the banking system can be based on... best principles," Brown said at a pre-summit meeting of European leaders last month. Since it first convened in 1999, the G-20 has traditionally been a gathering of finance ministers. But Thursday's meeting will bring together heads of state and government following the precedent set at last November's gathering in Washington DC in response to the scale of the economic meltdown. Map: How is the world coping with the crisis? iReport.com: What do you want from G-20? Other members are Australia, Turkey, Indonesia, South Korea, Argentina, Mexico, South Africa, Saudi Arabia and Indonesia. Spain and the Netherlands have also been invited to participate. The European Union is also admitted, representing member states without a seat at the summit table. Collectively, the G-20 accounts for around 85 percent of global economic output. German Chancellor Angela Merkel, who has already rejected calls for further public money to be spent on economic stimulus packages, has dampened expectations for the summit, saying over the weekend that the economy could not be fixed in a day. "We are talking about building a new global financial market architecture and we will not be able to finish this in London," Merkel said in an interview with the Financial Times. The summit marks U.S. President Barack Obama's first major appearance on the international stage. As the head of the world's largest economy, the outcome of the summit will likely depend on Brown's abilities to persuade Obama to back his proposals. Obama has already been forced to play down an apparent rift with European leaders over his stimulus plan to haul the U.S. out of recession, which the Czech Prime Minister, Mirek Topolanek, who will represent the EU at the G-20, described as a "road to hell." "We are living through a time of global economic challenges that cannot be met by half measures or the isolated efforts of any nation," Obama wrote. "Now, the leaders of the Group of 20 have a responsibility to take bold, comprehensive and coordinated action that not only jump-starts recovery, but also launches a new era of economic engagement to prevent a crisis like this from ever happening again."